Last week, the Huffington Post reported on a new guide recently issued by Third Way, an “influential centrist Democratic group,” for the purpose of helping lawmakers previously opposed to marriage equality take a public stance in support of the cause without earning the dreaded “flip-flopper” moniker. (Not a bad idea, right?) The document advises these new equality supporters to share their personal stories and those of family members and friends, emphasize that marriage is about love and commitment rather than engaging in a sterile discussion about rights, and meet people – even those who currently oppose marriage equality – where they are, knowing that they, too, have the potential to “evolve” on the issue. So far, so good. Now don’t get me wrong, if there’s one thing I despise most about our current national discourse, it’s the ridiculous abuse and ubiquitous misuse of the false equivalency meme. Both sides always share equal blame, we’re told. It isn’t polite to single out one person or party over another. Simple acknowledgement of a current political reality – for example, that American politics is being jolted ever further to the right by an increasingly deranged Republican Party – means the observer is biased or partisan (two terms with almost as much baggage as “flip-flopper”). The idea that it’s inappropriate for media outlets to consult certified anti-gay hate groups about LGBT rights issues in an effort to “hear from both sides” is not a matter of common sense, it’s some kind of agenda. However, where LGBT issues and racial issues intersect, I must emphatically draw an equivalency in order to make a point that I’m particularly passionate about: people on both sides – liberal and conservative, pro-LGBT and anti-LGBT – actively avoid equating gay rights with civil rights. Some even go so far as to condemn those who make any association between the two. This avoidance is dishonest, insulting, and demeaning to lesbian, gay, bisexual, and transgender people of all racial, ethnic, and cultural identities. It must stop immediately; there are no three ways about it. Make no mistake – I am not suggesting that race, sexual orientation, and gender identity/expression are in any way the same. I am also not attempting to equate the collective histories of racial and sexual minority groups or the personal experiences of any members of these groups. To do so would be foolish. What I am saying – no, declaring – is that the struggle for African-American rights and the struggle for LGBT rights are two fronts in the same battle. Both involve a minority group singled out by the majority for discrimination, unequal treatment, and persecution on the basis of an intrinsic and immutable characteristic. Both movements arose when a critical mass of courageous people decisively pushed back against bigotry and institutionalized oppression for the first time. And in both cases, the work of achieving legislative, judicial, and cultural equality is ongoing. 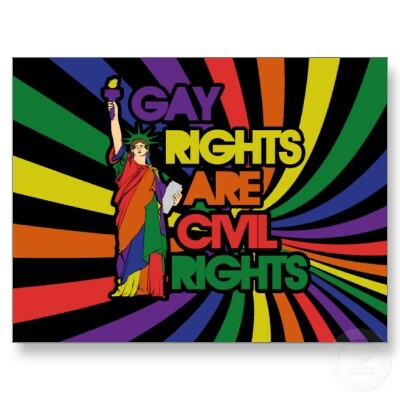 So while the details may be different, at a fundamental level, the fight for African-American civil rights and LGBT civil rights are both part of the same civil rights movement. I can hear the naysayers now. One might say, “How dare you? We’ve been taken to America against our will, enslaved, whipped, raped, attacked with fire hoses, batons, and dogs, subjected to ‘separate but equal’ Jim Crow laws and medical experimentation, jailed, and lynched.” Another could retort: “Excuse me? We have been persecuted by religions and governments for centuries, imprisoned, castrated, lobotomized, queer-bashed, ‘correctively’ raped and subjected to other ‘separate but equal’ laws, forced into damaging ‘pray away the gay’ therapy, interred in concentration camps, stoned, and hanged.” But playing the my-group-has-suffered-more-than-your-group game – what prominent African-American lesbian blogger Pam Spaulding aptly terms the Oppression Olympics – is both futile and tiresome. No single group has earned the exclusive right to use civil rights language. Nobody is well-served when we construct hierarchies of oppression. After all, at the end of the day, you’re equally unemployed whether you’re fired for being trans or for being an African American. Hate crimes are just as evil whether they’re driven by the victim’s gender expression or their skin color. (The bruises hurt just as much, too.) And James Byrd, Jr. – murdered because he was black – is every bit as dead as Matthew Shepard, who was killed because he was gay. I can’t even begin to tell you the verbal and logistical contortions I’ve heard many of my liberal, progressive, pro-LGBT friends put themselves through in order to avoid the mere appearance of an acknowledgement that the civil rights battles of sexual and racial minority groups are part of the same struggle. According to Spaulding, “any challenge to [the enforced separation of the two movements] amounts to stepping on the third rail,” and most people would rather spare themselves the shock, thank you very much.